Welcome back. You’d like to be healthier, wouldn’t you? Well, all you have to do is eat ice cream. Oh, not just any ice cream. It has to be loaded with antioxidants. And not just any antioxidants. No, you want polyphenols. Those are the antioxidants you get from plant-derived foods like fruit, vegetables and--please don’t make me eat it--chocolate. Anyway, that’s what research collaborators from Italy’s University of Rome, found. I know you’ve heard about antioxidants, but the rules say I have to offer a bit of background. I’ll start with free radicals. Those are highly reactive, unstable molecules generated by cellular processes (e.g., when we metabolize food) as well as by factors such as ultraviolet light, air pollution, smoking, trauma or excess heat. There are many kinds of free radicals; in living tissue, most contain the element oxygen. Why do we care? Free radicals, especially in high concentrations, can cause cumulative and debilitating cell damage associated with many chronic diseases. Antioxidants come to our rescue. They interact with and neutralize free radicals. Antioxidants are natural or manufactured chemicals, including vitamins A, C and E, carotenoids, lycopene, selenium and the plant-derived polyphenols I mentioned. Our bodies produce some antioxidants, and we get the rest from external sources, primarily diet. If our diet is poor, free radicals can run amuck. You can pop a dietary supplement, but while a diet with ample antioxidants promotes health, high-dose supplements of antioxidants may be linked to health risk. Eat better, skip the pills! The usual approach to producing more healthful ice cream is to reduce the fat and sugar contents. Instead, the University of Rome researchers tried increasing the antioxidants. For their small-sample study, the researchers recruited 14 healthy nonsmokers (7 male), age 20 to 40. Those volunteers had to forego medications, intensive physical activity and polyphenol-rich food for two weeks before beginning the study. Additional testing included measures of oxidative stress (d-ROMs, hydrogen peroxide) and vascular function (serum polyphenols, NOx, FRAP, FMD and RHI) before and two hours after eating the ice cream, and another exercise stress test two hours after the ice cream. After a one-week break, the volunteer assignments to the antioxidant or control ice creams were switched and testing was repeated. The researchers found that, when volunteers ate the antioxidant ice cream, their oxidative stress decreased, vascular function increased significantly and exercise tolerance improved. In contrast, no changes were observed after eating the control ice cream. In short, an ice cream rich in polyphenols effectively promoted good health. I, of course, have a few comments. The study’s antioxidant ice cream included green tea extract. I drink green tea daily and a sprinkling of green tea extract is probably healthy and safe (see earlier post, Tea Time). But high-dose extract supplements and concentrated infusions of green tea have been implicated in many cases of liver damage. I also should mention that, several years ago, various media outlets were tracking a University of Missouri food chemistry researcher’s progress in developing ice cream with added antioxidants, fiber and probiotics. I didn’t find any peer-reviewed publication on the work, yet the resulting ice cream was produced for at least local consumption. 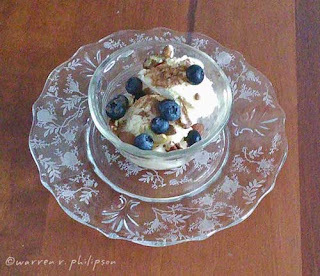 Finally, I suggest that If you can’t find ice cream (or frozen yogurt) with all the right stuff, buy it sugarless and add a banana, berries, nuts (pecan, walnut or hazelnut) or even dark chocolate. Yes, it’s OK to forget the ice cream and just eat the dark chocolate (see earlier post, Chocolate for Health). Thanks for stopping by.